the local school for adventurer. you take the final examinations. number of treasures you bring back. starting point for your way into the far world. Ok, this was an introduction to the game Ya3dag. But the game is more a technology demo of the graphics engine Quake2Terrain and the associated game dll Q2Tgamex86. Want to create your own levels? designed for rapid level creation. 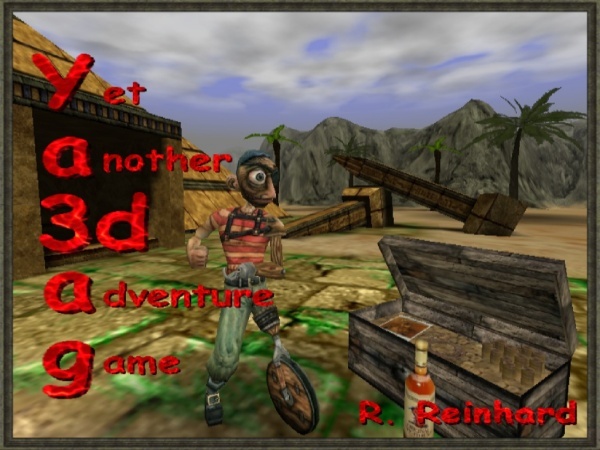 Ya3dag is based on the quake 2 modification Quake2maX and the lazarus game dll. models and entities are managed in this editor. Quake2 and quake3 player models can be used as player figures and for NPC’s (misc_actor). Quake3 player weapons are used for the quake3 player models. bsp models and terrain splatters. Existing texture-shaders can usually be reused. the behaviour. The NPC’s have a memory and the player can talk with them. are and where to go. Add splats to the terrain. Models of type .md2 .md3 and quake 2 .bsp are managed here. Lights. Shadows are seen immediately. Environment simulation. Day and night change. A day in game life corresponds to 24 Minutes. There is a sun and a moon walking over the sky. Rain, snow, lightning and clouds. Physic simulation based on ‘Bullet Physics Library’ software. New levels appear in the offer of the travel agency.